1)It would be completely wrong if I would say don’t go to a skin specialist, because zero guidance can worsen the acne. So start by getting your acne treated. Once your skin gets recovered or better, only then you can learn to control and take things under your hands to stop acne from erupting again. 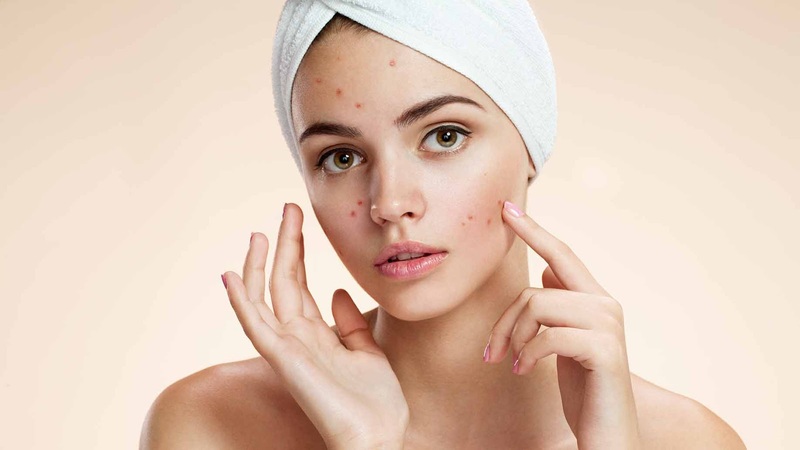 2)There are many myths that claim acne happens only to those who eat fried and chocolates (“that’s what you hear aunties saying and nagging you about when you get acne”) but there is no proof to support that claim. Least you can do is avoid frequent consumption of it, drink lots of water (which helps in cleaning toxins of the body away, especially if you start your day with a glass of normal or lukewarm water) and try to eat the normal homemade food. 3)Stay away from germs. Eating out transfers germs inside your body. Every time you come back from outside, even if it means a close grocery store, remember to wash away the dirt as soon as you enter the house. Carry a hand sanitizer with you everywhere, but prefer to wash the hands because even a hand sanitizer contains chemicals. Most of them contain alcohol, so beware those vegetarian and non drinking folks! 4)Don’t conceal away! Makeup concealers are a great way to demonstrate an acne free skin, but concealing them doesn’t vanish them. Layering away makeup can aggravate acne. So avoid using foundation and concealers while your face decides to erupt. Remember acne can happen even if you apply something (cream, cosmetic, medicine, etc) that does not suit your skin. Let it breathe instead of suffocating it and making it worse. The most it would do is make people see a bump on your face but if you irritate the enemy, it is going to call a battalion to fight the war. By that I mean it could turn into cystic acne. 5)Your body and face skin is not same. Facial skin is much more sensitive and needs extra attention (yes its one of those demanding attention seeking child who through various means try to grab your attention). You might have a dry body skin but your facial skin can still be oily. Thus, you shall never apply the same moisturizer to face and body. Few years back when I learned about CTM (Cleansing, Toning, and Moisturizing) routine, I used a body lotion to dehydrate my face. Seconds later my face began to itch and redden in certain spots and I quickly washed it away. 6)Do not layer on multiple creams and treatments over each other cause their chemical might clash and react which can lead to acne. 7)If it works for you then try to divert yourself to natural remedies. Natural substances have no chemicals and do not drastically react back, whereas chemical might not suit you. 8)Stay away from touching the bumps! It won’t magically disappear with your touch. Your touching can infect other areas too. Plus do not rub towel on your face after you’ve washed your face. Pat it dry instead. 9)Mangoes are delicious, but stay away from them if you have acne prone skin. It’s not a hard and fast rule but I have seen for myself that eating mangoes cause one or more pimple on your face. You might think mango is a fruit, it needs to be healthy, but certain people might get affected cause of them. Certainly the mangoes which you get in India are such which has always made me get bumps. If you really can’t stay away from mangoes, then try grinding it away into milkshakes. 10)Never burst or squeeze out your pus filled pimple or any pimple at all. This can cause dents in your skin which can recover to an extent but not fully spare you. After your acne decides to end the battle, you’d be left behind with scars that get engraved on your face.